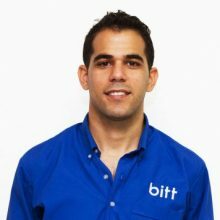 Barbadian Gabriel Abed, Co-Founder and CEO of Bitt Inc., is recognized as the Caribbean’s most leading authority on digital currencies. At the age of 30, the Barbados-based entrepreneur is also an internationally-acknowledged authority on the digital currency evolution, having lead discussions and spoken on the subject of ‘Blockchain Technology’ at the Caribbean Development Bank , the International Monetary Fund and World Bank, the United Nations, the Commonwealth Secretariat, multiple Central Bank forums and other world stages. His company, Bitt, is a Barbados-based, FinTech, purpose-driven enterprise, established to offer financial solutions to the region’s unbanked community. Built around the twin pillars of global connection and financial inclusion, Gabriel believes that Bitt offers revolutionary and unprecedented solutions to address the range of other disruptive issues that face the Caribbean including de-risking, digital cash issuance, remittance and payment gateways while providing immense transformative potential to kick-start the region’s economic resurgence through a smart digital economy. With a significant multimillion dollar injection in his company from Overstock.com, the desire, grit and metal that Gabriel embodies has been recognized by global partners. This international recognition has equally been matched by global leadership. In February 2016, Bitt broke new ground by launching a digitized version of the Barbados dollar; the first ever world-wide example of a digitized fiat currency being approved and embraced by a Central Bank. Gabriel’s expertise has been developed through a pairing of academic pursuits driven by a belief in the revolutionary potential of technology and decentralized distributed ledgers for global good. He is a 2016 Caribbean American Heritage (CARAH) Vanguard Award recipient. His intellectual interest in Bitcoin and Blockchain Technology took root in 2010 as an undergraduate at the University of Ontario pursuing a degree in Information Technology where he majored in Cryptographics and Network Security, graduating with Honors. Enthralled by the potential of cryptocurrencies, and conscious of the revolution unfolding around him, he became an early adopter and lifetime evangelist. A passion for positive change, infused with 15 years of experience in the software and technology has lead to his current, and most groundbreaking journey as CEO and Co-Founder of Bitt.